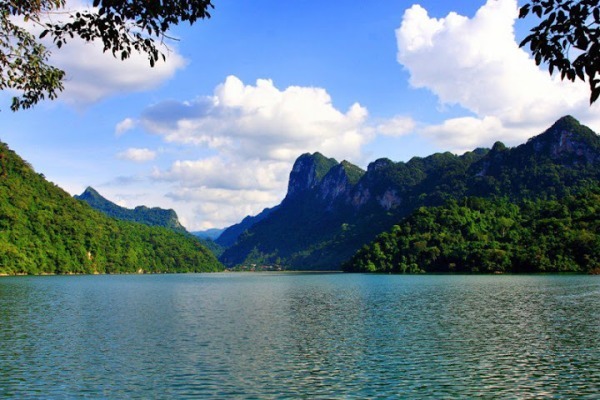 Ba Be National Park is an abundant bio-reserve area containing the world’s only fresh-water karst lake and several rare species of fauna and flora. Ba Be National Park celebrates its 5th anniversary as an ASEAN Heritage Park in 2009. 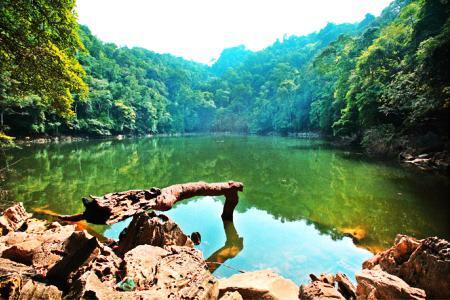 The bio-diverse 10,048ha park – home to 1,268 species of flora and fauna, a series of caves and a gigantic fresh water lake – was established in 1992 by the Vietnamese Government to preserve forest ecosystems in the northeast. Along with the 15,000ha forest in neighboring Na Hang District of Tuyen Quang Province – home of three newly discovered groups of Francois’ Langurs, an endangered species with a mere 180-200 animals left in Viet Nam – Ba Be plans to apply for UNESCO heritage status. "The national park, with assistance from the Viet Nam National Commission for UNESCO applied to make the park a UNESCO Natural site. As one of the 27 ASEAN heritage gardens, Ba Be has the potential to attract nature lovers with its 450ha natural fresh water lake, and 553 species of mammals, birds, reptiles, amphibians and fish. discovering wild Francois’ Langurs is a sign that the park’s reforestation and preservation policies are proving effective. A few white-eared night herons (Gorsachius Magnificus) which mostly live in China, were found in the Lung Ly forest on a limestone peak. The appearance of the special bird is a reason that the park’s administration proposes to list Ba Be as a Ramsar Convention site. An official from the National Commission for UNESCO Viet Nam said, Ba Be park and Na Hang forest would need further scientific study on indigenous fauna and flora to see if they meet the criteria of an UNESCO bio-diverse heritage site. With the height of 30m and the length of 300m, Puong Cave, also called Đông Puông in Vietnamese language, is considered a large cave which belongs to Ba Be National Park. 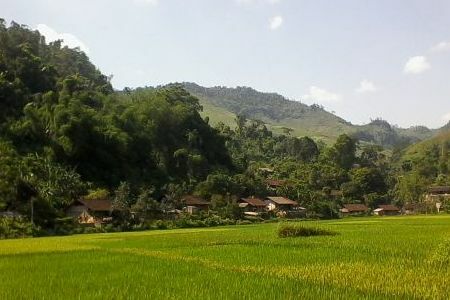 It is an interesting place that should not be missed by tourists in Vietnam travel. 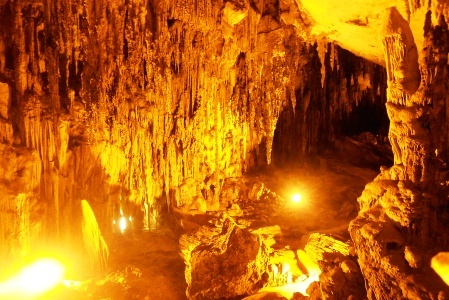 Puong Cave ( Puông) - a large cave with 30m high, 300m long, is an interesting place in Ba Be National Park that tourists in Vietnam travel should visit. Puong Cave located on the Nang River, 5km from the town of Ba Be District, Bac Kan province, was created by the rivers current as it flowed next to the base of the Lung Nham Mountain, which is a chain of Limestone Mountains. 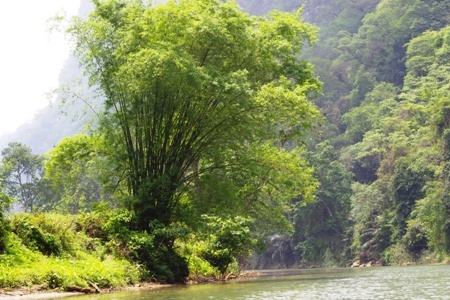 Dau Dang Waterfall is located where the Nang River enters Tuyen Quang Province. It flows for 2km where the Nang river is blocked by various sized stones slopping for nearly 500m. The pleasant look of the waterfall and the primitive nature of the forest are extremely impressive. Furthermore, there is a special rare and valuable species of fish called ca chien living in the river, some of these fish weight over 10kg. According to the local government, it is not the lack of money that keeps the inhabitants from building new and convenient houses but the love for their ethnic heritage. They strive to preserve and protect those cultural values from disappearing forever, because without these beautiful stilt houses, Pac Ngoi Village is no longer Pac Ngoi village. Tourists in Vietnam travel coming to Pac Ngoi are not only entitled to witness with their naked eyes the most wonderful scenery of Northern Vietnam: a plethora of austere yet interesting stilt houses blending themselves with the glimmering mist and the shinning Ba Be Lakes, but also to stay in the rhythm of the Tay culture. This claim can be easily proven by the fact that visitors joining tours in Vietnam have to remove their shoes once they step the very first steps on the staircase of a stilt house. Inside the house, ethnic people gather around the gleaming fireplace, forgetting themselves in the sophisticate stories about the economy or the politic. They create a world that shares nothing in common with the big cities where electronic lights and high buildings are ubiquitous. They are just there, in their beautiful social center, waiting to share their most interesting stories about life with you. 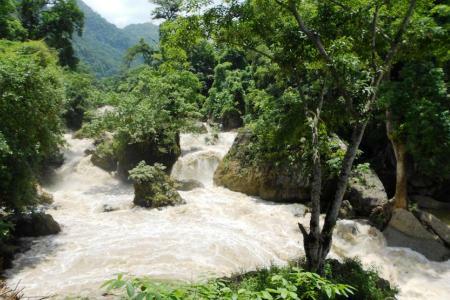 The Nang river is part of a large drainage system that brings water from China to Cao Bang via Ba Be, eventually flowing to the Lo river (Tuyen Quang province). The section of the Nang river between Puong cave and Dau Dang village offers a wonderful opportunity to view tropical limestone forest and numerous limestone formations. Keep your eyes open for birds, especially kingfishers and small forest species. Here is also a good place to meet some of the local residents going about their daily lives; planting maize on the narrow river banks, fishing, or travelling to or from one of the numerous local markets. Not far from Ban Cam, the Nang River meets the waters flowing slowly north out of Ba Be Lake. At this point the lake has narrowed such that the meeting point of these two water courses can be difficult to see from the Nang river approach. However, for several months of the year there is a clear distinction in colour between the clear lake waters and the soil-laden and reddened waters of the Nang. At these times a line forms at the confluence where the waters blend together, indicating that Ba Be lake is yet to suffer from soil erosion on the scale of the Nang River. This point is also marked by a white brick national park ranger post, which can be seen clearly from the river. At the northern end of the lake, there are numerous orchids and interesting plants to be seen overhanging the water. This is also the best point at which to start looking for larger water birds like egrets and herons. 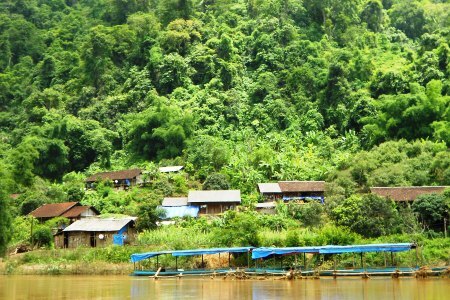 Ban Cam is a small Tay village spread along one kilometre of the northern bank just before the Nang river meets Ba Be lake. 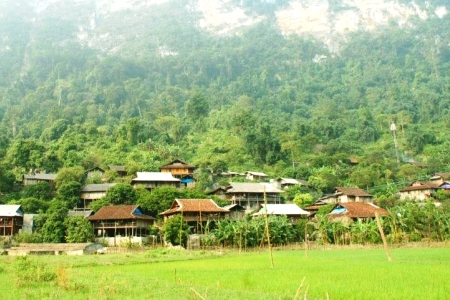 The ‘centre’ of the village occupies a small valley, which is perpendicular to the Nang River and contains a small freshwater stream. The people of Ban Cam are traditionally users of the local dugout canoes — doc moc — for which Ba Be is famous. These are carved from single trees, and although precarious-looking are capable of carrying several people in safety. Bo Lu and neighbouring Coc Toc, directly opposite the main landing, are a great place to take a short walk through history. There is now road access between all of these villages and the park reception, although boats still offer the most relaxing and enjoyable way to make a visit. Refreshments are available in all of these villages, and there is the option of arranging home-stays in a number of traditional Tay stilt houses. This is a great way to get a feel for local life, as well as see some traditional dance and song or enjoy local foods. Situated on “lake three” of Ba Be lake, Fairy Pond is a small water body in a rock basin isolated from the main lake. A short walk from the lake shore brings you to the pond. The pond is fed from waters seeping underground through the surrounding rock, making Fairy Pond the same level as Ba Be. Fairy Pond is home to a number of local fish and other aquatic animals. Local fishermen sometimes come here to try their luck, though this is surely as much for the quiet and seclusion as it is the hope of a large catch. Like the other special features of Ba Be, Fairy Pond is evoked in local legend; the name is in reference to the story of a local hunter who visited the island and became bewitched by fairies whom he found bathing at the pond. New cement steps have been built outside and inside Hua Ma Cave, paving an easy way for travelers to stroll up and down the new tourist destination in Ba Be National Park in the northern province of Bac Kan.
Hua Ma in Quang Khe Commune is ranked among the most beautiful and interesting caves in the national park because of its magnificent stalactites and the legend that has been told for generations. This legend has put it that a king and his entourage once approached an area near the Hua Ma Cave, and the horse of the king was unable to cross a stream in the area. After several unsuccessful attempts to cross the stream the king got off his horse and asked locals for the reason. Then he found out that the area was home to wandering souls of the casuists, whose merciful cry was often heard from the cave at night. The king told his soldiers to kill horses and let the heads drift along the stream. The king also ordered the erection of a temple nearby and made his way into the cave to sit there and recite Buddhist scriptures in the hope that the wandering souls would be released. From that day, no-one has heard the merciful cry from Hua Ma Cave. It is from this legend that the name of the cave came into existence as Hua Ma means the horse’s head in local dialect. Nowadays, visitors can see the stalactites that more or less resemble a throne where the king was seated on. More magnificent stalactites shine under the electrical lights along the path in the cave. The old and young stalactites look like towers, lotus flowers, stone poles and other shapes depending on the imagination of visitors. 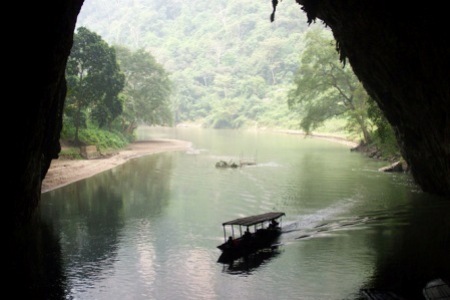 To visit Hua Ma Cave, visitors can walk or travel by small passenger car through eight kilometers from the administrative section of Ba Be National Park. On arriving at the cave, they have to walk up 300 meters to the three-meter-wide, five-meter-high entrance, and then stroll down into the cave, which is more than 500 meters long and 40-50 meters wide. Do not forget to bring a flashlight to see more stalactites far from the path or in areas which are in darkness.